【動物, 動物学】 カメ 《★【類語】 tortoise は主に陸ガメをいい，turtle は海ガメをいう》. From Middle English tortuse, tortuce, tortuge, from Medieval Latin tortuca, of uncertain origin. May be from Late Latin tartarūcha, from Late Latin tartarūchus, from Ancient Greek ταρταροῦχος (tartaroûkhos, “holder of Tartaros, Tartarus, the land of the dead in ancient stories”), because it used to be thought that tortoises and turtles came from the underworld and they were commonly paired with such infernal beasts; or from Latin tortus (“twisted”). Any of various land-dwelling reptiles, of family Testudinidae, whose body is enclosed in a shell (carapace plus plastron). The animal can withdraw its head and four legs partially into the shell, providing some protection from predators. Differences exist in usage of the common terms turtle, tortoise, and terrapin, depending on the variety of English being used. In American usage, turtle is often a general term; tortoise is used only in reference to terrestrial turtles or, more narrowly, only those members of Testudinidae, the family of modern land tortoises; and terrapin may refer to turtles that are small and live in fresh and brackish water. 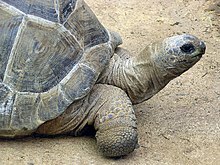 British usage, by contrast, tends not to use turtle as a generic term for all members of the order, and also applies the term tortoises broadly to all land-dwelling members of the order Testudines, regardless of whether they are actually members of the family Testudinidae. Land tortoises are not native to Australia, yet traditionally freshwater turtles have been called tortoises in Australia.